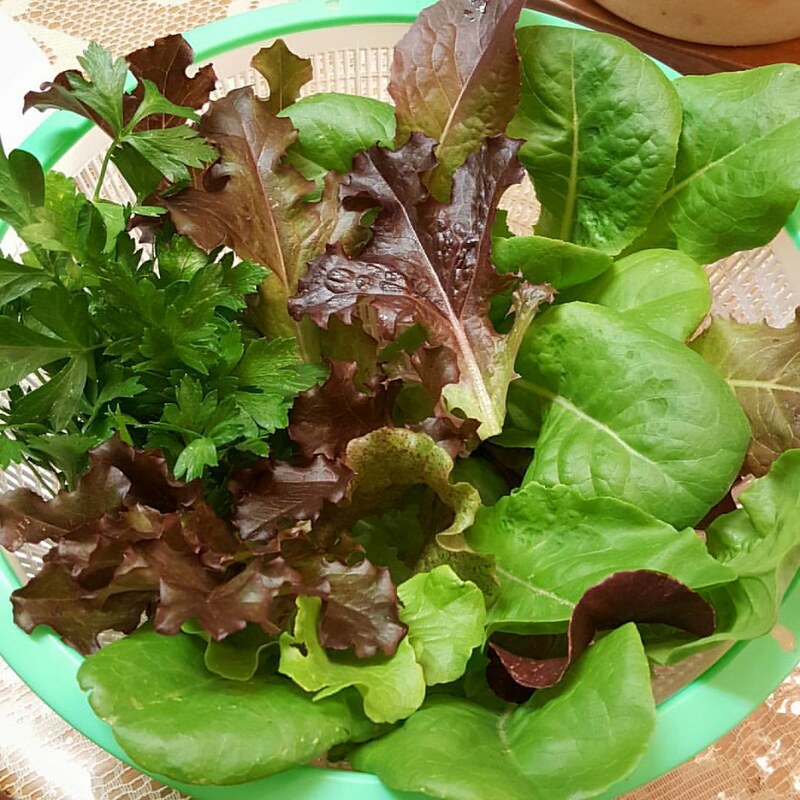 Today’s harvest was a variety of Lettuce and Parsley for a Lettuce/Parsley Salad. 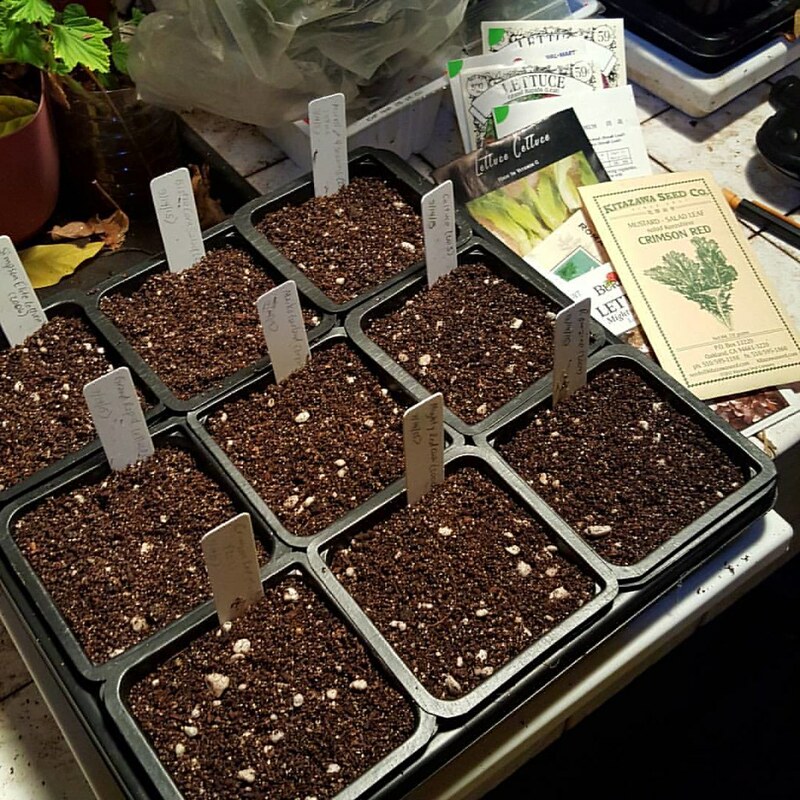 This inspired me to sow various Salad Greens seeds that I want to use up since they are old or getting old (and I can’t just throw them away). I really not counting on a lot to germinate, but if I get a few plants out of these, that’ll be good. 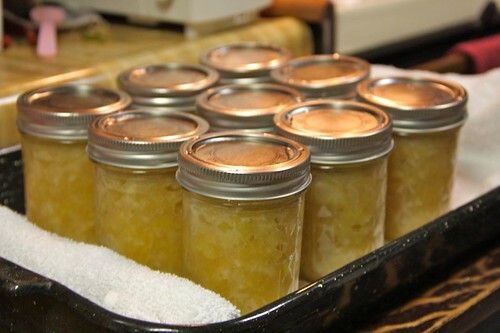 I never posted photos of the Apple & Pear Sauce which I made back in September 2011… So here they are. 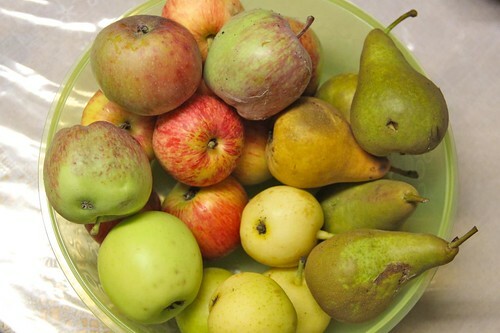 I harvested a bunch of Apples and Pears from our garden. 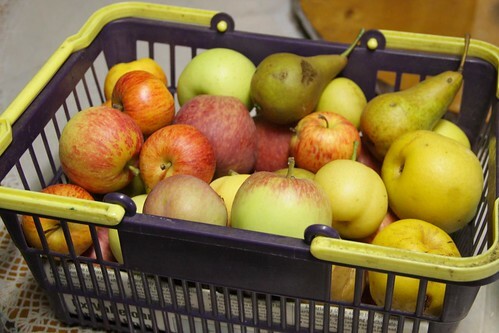 We have a bunch of trees, so I just take a couple here and a couple there for a mixture of different Apples, Pears and Asian Pears. 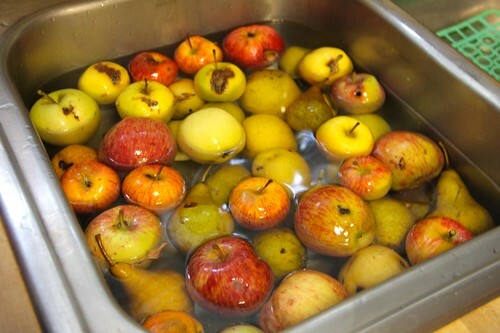 Just dump them into the sink and wash them in a pool of water. Skin them… You can leave the skins on, but I like the Apple and Pear sauce without the skins. 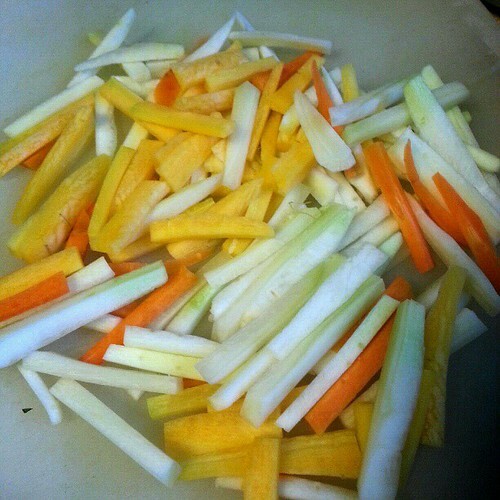 Chop them up into pieces. 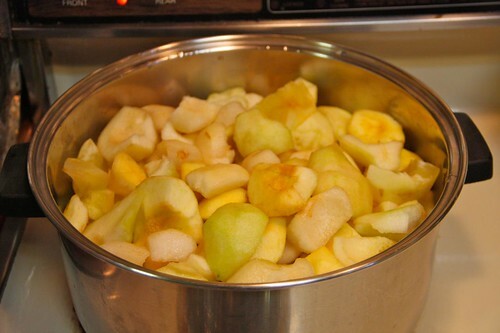 Place the sliced Apples and Pears into a big pot with about a teaspoon of cinnamon and some sugar. I usually put about a quarter to a third of the amount that the recipe calls for because my Mom doesn’t like it too sweet. 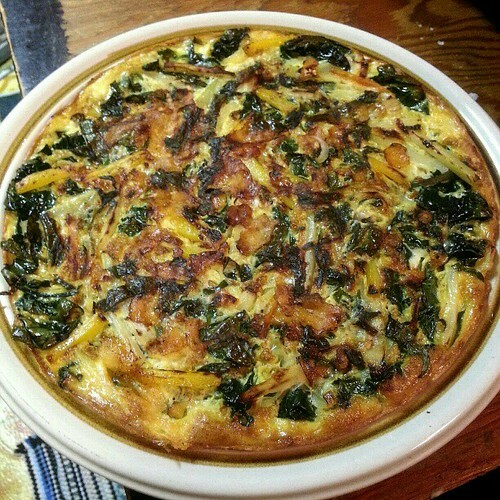 You can also add a little bit of lemon or use honey instead of sugar… You can find various recipes online. 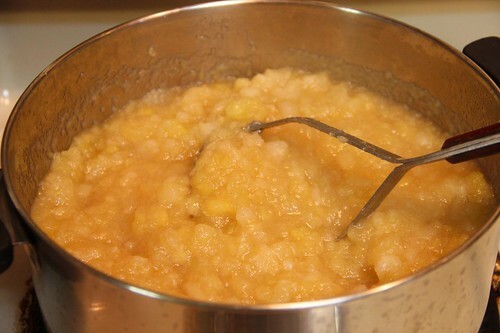 Set the stove between medium and high until the Apples and Pears soften and releases its liquid (I don’t even add water). Once it starts to bubble, reduce the heat to low… then just continue to mix, mash and cook it down until it’s a consistency that you like. I like a little bit of fruit chunks, so I don’t cook it too long. It will get darker as you cook it more. Once done, I place them in prepared canning bottles and boil the bottles according to the canning instructions. Once cooled, these should last for a while. 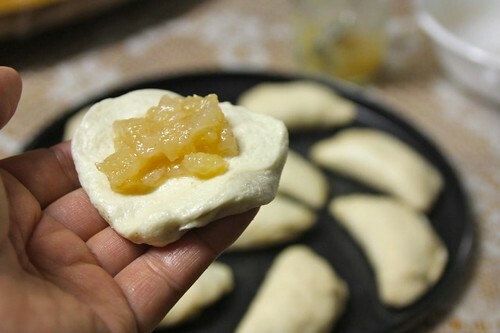 We have ours stored in the pantry and sometimes when I feel like making a simple and quick pastry, I’ll open a bottle and fill biscuit dough (from those refrigerated tubes) with about a teaspoon of sauce. Fold the edge together to enclose the filling and crimp the edges. Then roll the dough in cinnamon sugar and bake. 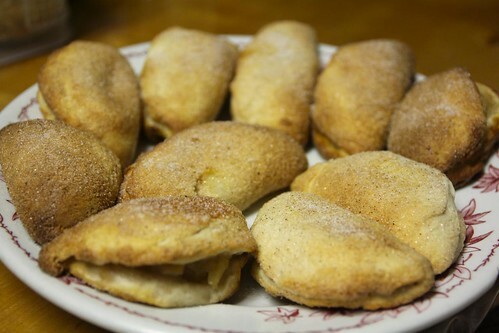 Eat while warm because once they cool down, the pastry may get soggy. I continued planting more Dirt Pots with veggies for the front yard, but first, I finished the Spinach and Elephant Garlic Dirt Pot (that I started yesterday) by adding bark mulch. I planted two more Dirt Pots. 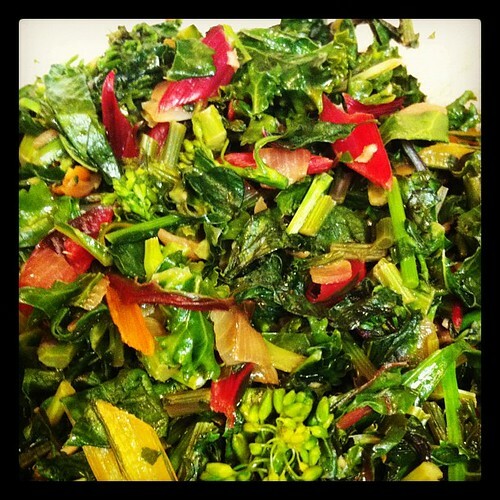 One with Red Russian Kale and one with Rainbow Swiss Chard that I had left over from late last year’s planting. 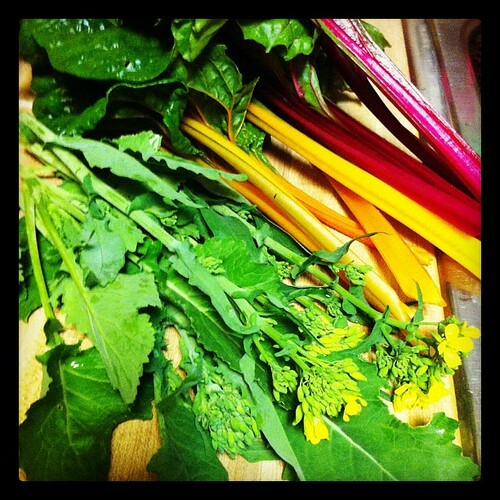 When I planted the Swiss Chard last year, there were so many seedlings in the cell pack. I only planted the biggest plants, divided the smaller ones left over and planted them into larger cell-packs, hoping they would grow… and luckily they did. 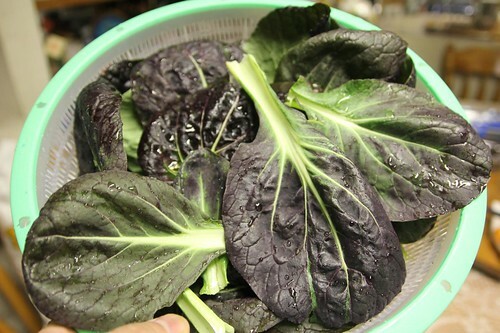 At the end of the day, I harvested the Gai Choy (photo below) and Purple Bok Choy (photo above) that were both starting to bolt. I have a feeling that the Gai Choi seeds I got were packaged wrong, because this actually looks like Tatsoi. I’ll do another planting and see what I get. In any case, it still makes a good harvest. 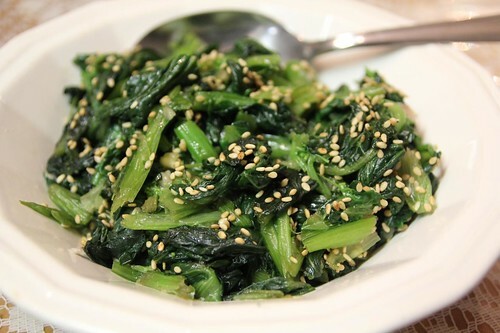 I saw a YouTube video where this woman made a Korean Spinach side dish, called Sigeumchi Namul. 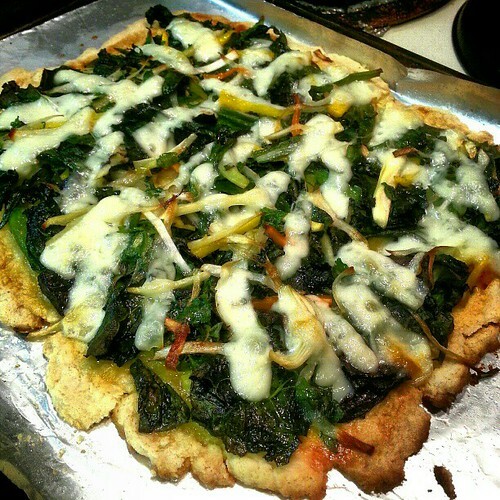 I made this substituting the Tatsoi and Purple Bok Choy for the Spinach. 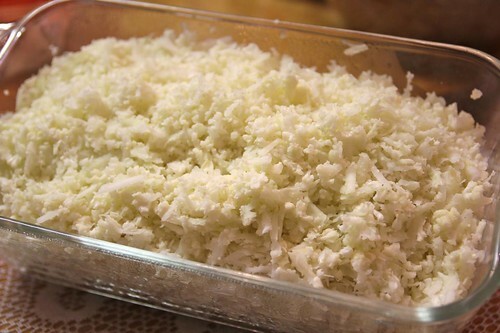 I also saw another YouTube video of a rice substitute/side dish called Cauliflower Rice. It’s so simple to make. Ingredients is just Cauliflower, salt and pepper. It was a really nice day today and I got to do some gardening and maintenance in my front yard veggie garden. If you didn’t know yet, I’m concentrating most of my vegetable planting in fabric pots (GeoPots, Dirt Pots, Smart Pots, etc.) in our front yard. 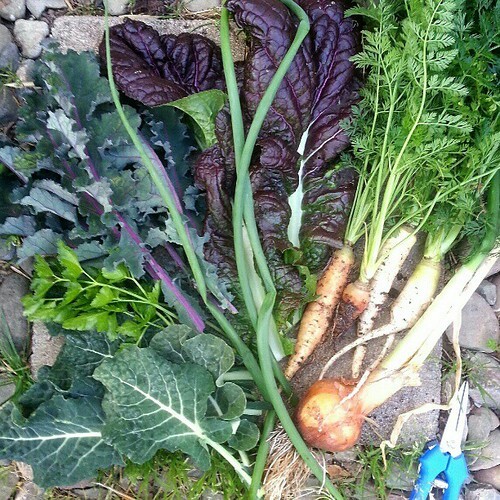 I experimented late last year with a few GeoPots and the veggies grew really well… some, a lot better than the ones in the back yard Square Foot Garden. I think it’s because there is full sun in our front yard, whereas our back yard gets a lots of partial sun. Almost all of the Flowering Kale and some of the Mizuna and Mustard were infested with gray Aphids (yuck), so I pulled those plants out, since they were not doing well. Two pots with the Curly Leaf Kale looks really healthy and are starting to get bigger, but I noticed that the young leaves in the center also had the gray Aphids! So I got a pump sprayer filled with just plain water and blasted the Aphids out. I’ll check the Kale in a few days and repeat if I find more Aphids. 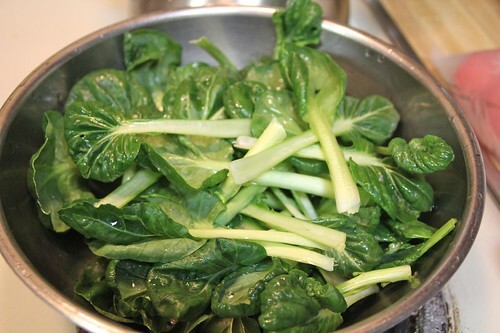 I did some maintenace and took out some of the older dead leaves from the Collards, Bok Choy, Lettuces and Onions. I also put some bark chip mulch in the veggie pots that didn’t have any. 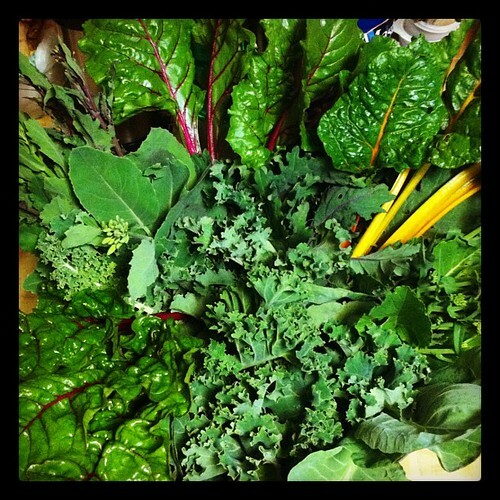 I harvested a bunch of greens for a big salad for the family: Romaine, Red Oakleaf and other Lettuces, Mizuna, Curly Leaf Parsley and a few (spicy) Red Giant Mustard. Yumm! We had so much salad and it was so good. I also harvested a few small Snap Peas. My Mom saves Green Onion bottoms (with root) from the kitchen and later plants them in the garden. We had a few on the kitchen window sill, so I took those and planted them in the empty spots in one of the 7-gallon GeoPot that has Red Onions. 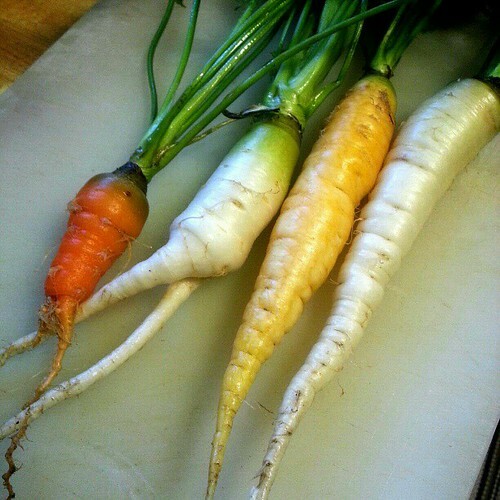 I planted carrot seeds in half of the pot back in the fall, but they either didn’t germinate or died. I also realized that I had some Shallots that I purchased a while back and never planted, so I divided those and planted them in the same pot. As the sun was setting, I planted two 5-gallon fabric Dirt Pots, each with four Spinach ‘Bonnie’ plants. 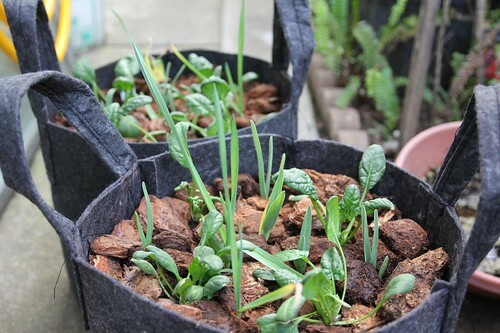 There seemed to be a bunch more space in the pots, so I planted the young Elephant Garlic in cell-packs that I had left over from last year’s fall planting. It was getting dark, so I’ll much these with compost then bark and place the pots in the front yard. 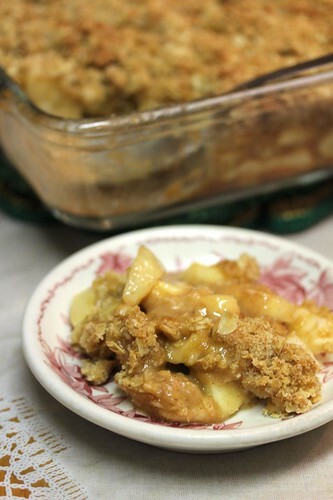 I harvest various Apples, Pears and Asian Pears from our garden to make an Apple and Pear Crisp. 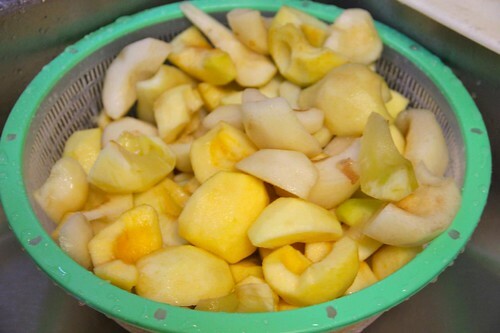 I harvested the two Asian Pear ‘Hosui’ fruits because they were starting to soften. I think I should have harvested them a few weeks ago when they were more firm. 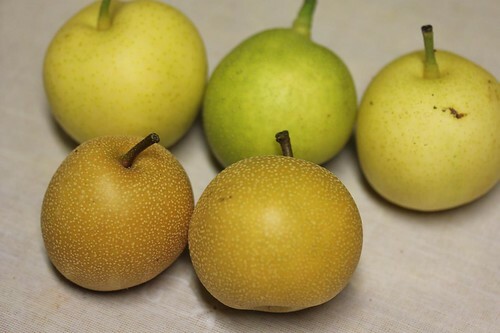 The Asian Pear ‘Hosui’ fruits are more brown and spotted than our existing Asian Pear (unknown variety) that they are grafted onto. 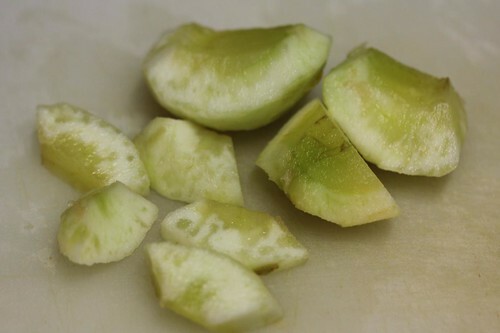 One of our Apple variety has splotches of semi-translucent areas inside the fruit. It looks mushy, but isn’t. My Mom says that this is normal and it tastes a little like Pineapple. I didn’t remember to take a photo of the unpeeled Apple. I’ll have to check the tree and take a photo. 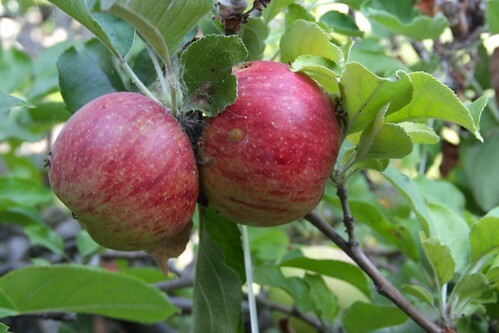 Anyone happen to know this Apple variety?